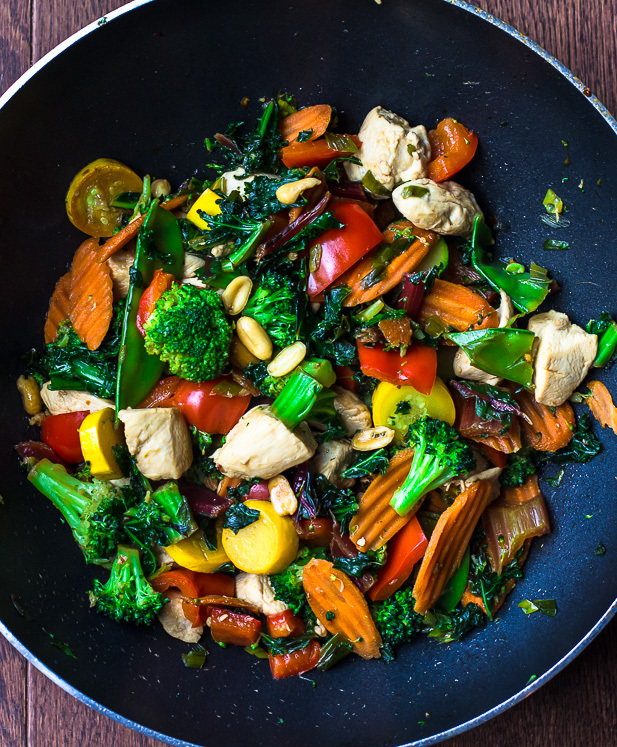 Do you remember that Szechuan Chicken Stir-Fry recipe I posted not too long ago? Well, I have a follow up recipe to share with you today that's so good, you must promise me you'll make it. This one takes a little more prep work because of the extra vegetables but it's just as fast if not quicker to cook. Perfect for when you're in a dinner rut. This will add some tasty zest to your palate. 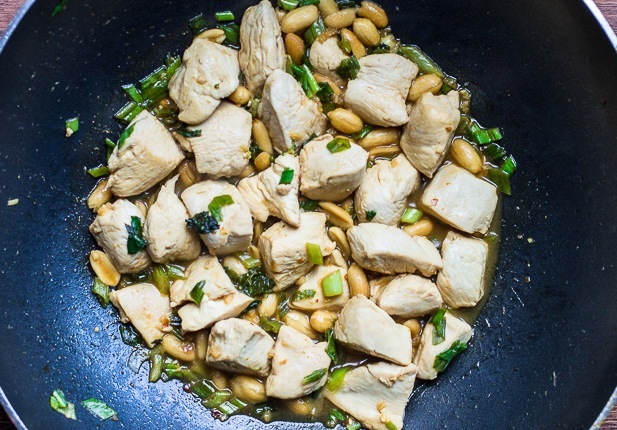 This Kung Pao Chicken packs flavour in spades. I think it's safe to say it could rival any bought from your favourite restaurant. I've made this recipe a few times now and we all loved it. It's like going out for dinner and taking a vacation from typical healthy eating, but really, it's super healthy and clean. When I set out to make this dish, I made sure to add loads of fresh veggies to the ingredient list. The fresh veggies really help bump-up the vitmain count. I mean just check out those wild vibrant colours! It is enough to make your mouth water! 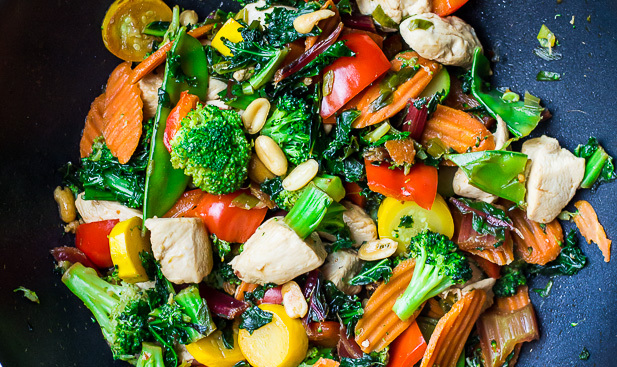 This Chinese dish will rival the best kung pao chicken you've ever had from a take-out restaurant. It could become a fast and easy weeknight favorite. Especially when it only takes 20 minutes to cook. Heat oil in a large non stick skillet on medium-high. 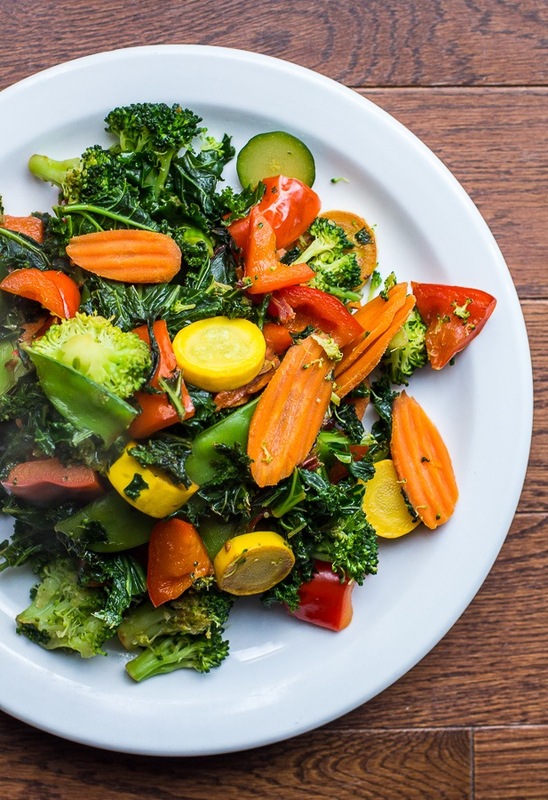 Add bell pepper, kale, red chard, broccoli, zucchini, carrots and snow peas, and cook, stirring frequently, until the vegetables begin to soften and everything is almost cooked, about 5 minutes. 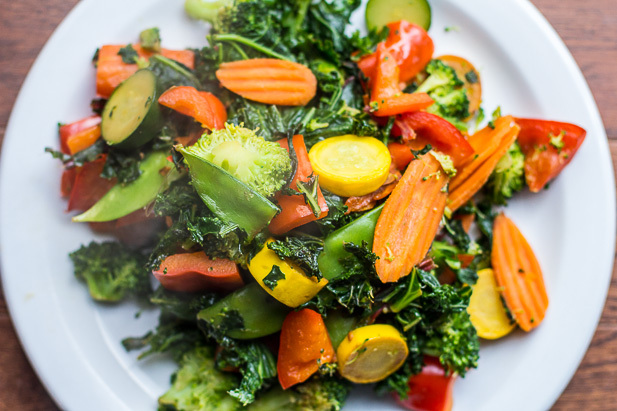 Transfer vegetables to a plate and place in the oven on low to keep warm. Heat remaining tablespoon of oil on medium-high. Add red pepper flakes, chicken and peanuts and cook for 5 minutes, stirring frequently. In a small bowl, stir together 1/4 cup water, soy sauce, garlic, ginger, onions and rice vinegar. Stir the mixture into chicken and bring to a simmer. Cook for 3-4 minutes or until chicken is no longer pink inside. 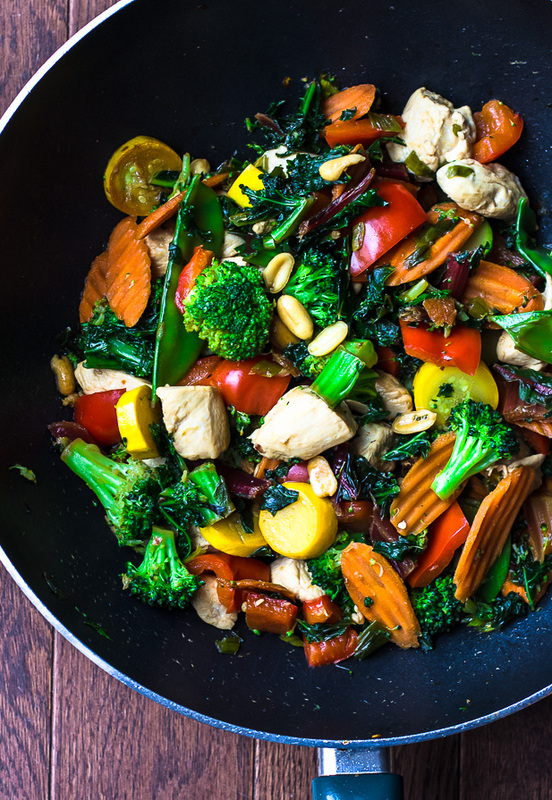 Return cooked vegetables to the skillet and give everything a good stir. Serve over top of rice, dividing evenly among 4 bowls.